Over the weekend, the Pantech Vega Iron 2 had leaked out, and it looked somewhat familiar. Like an older Samsung Galaxy S device, which shouldn’t be surprising since it is partially owned by Samsung and is from South Korea as well. 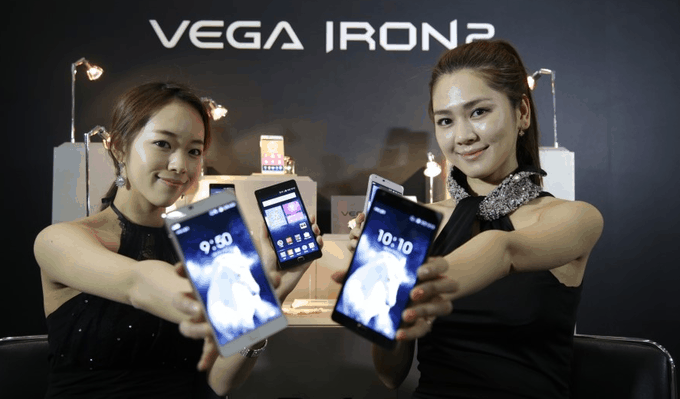 Now the Vega Iron 2 is out and is official. And I’d have to say that it stands up to the LG G2, since the specs are almost identical. Speaking of specs. We are looking at a 5.2-inch 1920×1080 resolution AMOLED Display, Qualcomm Snapdragon 801 processor clocked at 2.3GHz, 3GB of RAM, 32GB of internal storage, 13MP camera on the back and a 2.1MP front-facing shooter. There’s also a 3220mAh battery inside, it supports LTE-A networks and is running on the latest version of Android. That’d be Android 4.4.2 – KitKat. So like I said, it matches up to the LG G2 spec-wise, and surpasses a lot of other devices. We are not sure if that battery is removable, but since Samsung does own part of the company, I’m willing to bet it is. It’s a great looking device coming out of Pantech, and the specs are all there as well. The only thing is, we probably won’t see this over here in the US. But if it were made available in the US, I’d definitely buy it. Because it is a beast. Pantech is pretty popular in Korea, now they don’t sell as many devices as their Korean competitors Samsung and LG, but they are pretty close. Hopefully Pantech finds a way to expand outside of Korea, and over here to North America soon. I know some of their devices have landed on AT&T and Verizon lately, but those have been low-end or mid-range devices. I really want to see them release a high-end device over here to compete with the Galaxy S5, LG G3, HTC One M8, Moto X+1, etc. Anyone else agree with me? The post Pantech Vega Iron 2 Becomes Official with Snapdragon 801, 5.2-inch 1080p AMOLED Display appeared first on AndroidHeadlines.com |.